During the auction consultation, we want to know everything about your property, your motivation to sell, and your expectations. A mutually agreed-upon marketing budget is collected in advance for property preparation, advertising and direct marketing. From the day a contract is signed, we go to work for your auction. Typically, auction day is scheduled 30 to 60 days after a contract is signed. Thorough due diligence is critical to make sure buyers show up on auction day. Our team will research all details of your property to give buyers a full picture of the existing and potential value. We work with some of the brightest minds in farming, ranching, and agribusiness to gather all information a buyer could need to put his or her hand in the air on auction day. With in-depth knowledge about your property, we are intentional about the prospects we pursue and are able to maximize the impact of our direct marketing. Legacy is raising the bar on how farm, ranch, and agribusiness properties are marketed. We craft a dynamic advertising campaign and marketing strategy to make your property stand out to the audiences who matter. Utilizing local, regional, and national promotions in traditional media and online resources, we get results. Targeted direct marketing campaigns ensure delivery of your auction materials right into the hands of potential buyers. When buyers arrive at your auction, we strive to anticipate every need they may have. 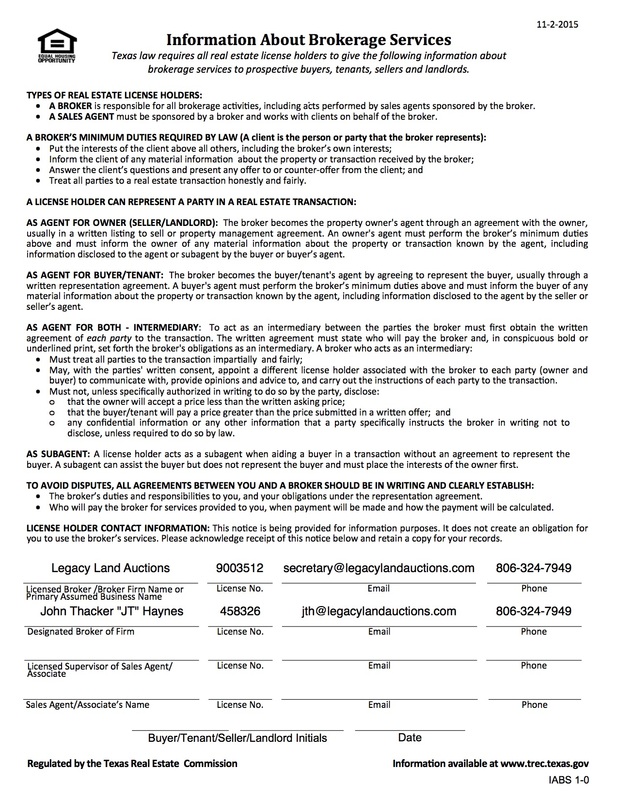 Legacy utilizes state-of-the-art software to manage the multi-parcel process and help buyers keep up with the auction. The entire Legacy team is committed to ensuring there is not a penny left on the seats and that our sellers get the highest contract price possible when the gavel drops. Sales contracts are signed immediately after the auction, and 10% non-refundable down- payment is collected from all successful buyers at the close of the auction. The Legacy team doesn’t stop working for you until every detail is complete and your sale is closed. We work with everyone involved to get you to closing day as quickly and seamlessly as possible. A 10% Buyer’s Premium is due to Legacy Land Auctions at closing. Focused on people, partnerships, and results, Legacy Land Auctions is committed to being the leading provider of marketing solutions for premier agricultural properties.